Average temperatures are at their lowest in the northern Italian city as well as precipitation. Days are cold but when the sun is out, it’s crisp and refreshing. Views of snow covered Alps from the top of the Duomo are fantastic. It’s also ski season. Nearby ski resorts near Milan such as Livigno, Courmayeur and Bormio have lower temperatures and are ready for all you ski enthusiasts. For fashion lovers , Milan hosts Men’s fashion week in January and Women’s Fashion week in February. 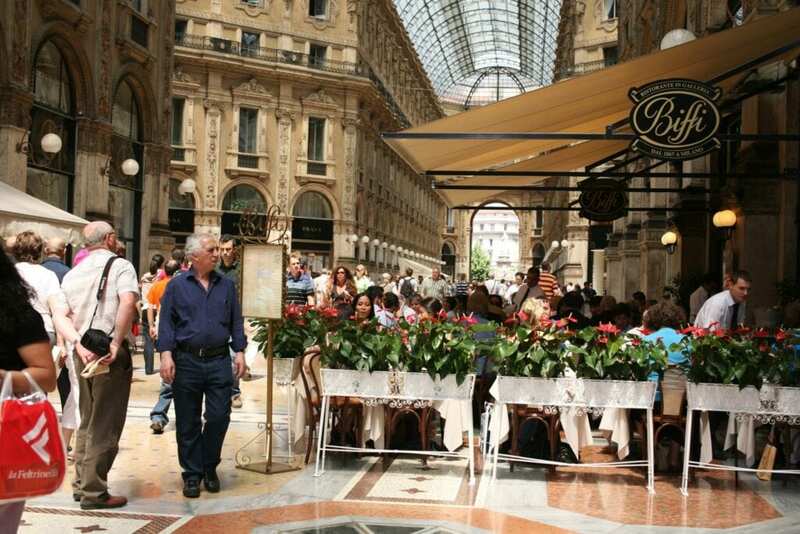 From January to February winter sales are on in the department stores and boutiques of Milan. The new summer collections are in stores starting in March. February is also time for Carnevale Ambrosiano, (the Venice Carnevale is the week before) and is celebrated in Milan’s Piazza Duomo with elegant costumes and masks. Don’t forget about Valentine’s day, Milan is a romantic city and has some of the most romantic hotels and restaurants, in the city center. What’s more romantic than walking hand in hand exploring the city. April showers bring the flowers – it’s not always sunny in Milan, but it is so romantic when the cobblestone streets of Brera are glistening after a fresh, spring rainfall and the flowers in the courtyards and parks start blooming. The city is busy with designers and architects from all over the world hustling about, visiting the shows and galleries during Salone Internazionale del Mobile Design week. There is an annual flower show and market on the Naviglio as well as the Sunday antiques market. The Milano Food festival is on with various location throughout the city. Summer courses at the art and fashion institutes begin in June. Also in June, fashion lovers will be back for Men’s fashion week. July and August are the warmest months and are comparable to the hot and humid summers of New York. August is actually quite pleasant. It’s a quiet time for the Milanese, the pace slows down and the sidewalk cafés are full of people sipping Acqua menta e ghiaccio (mint and ice) or a bubbly glass of San Pellegrino. However, Milan is a great location for visiting other cities like Turin, Venice or Bologna. Fly into Milan to Linate or Malpensa airports, rent a car and drive down to Tuscany stopping along the way in some of Lombardy and Emila Romagna’s most charming cities. Or take a tour of Lake Como and Venice. From July to August the Verona Arena host it’s musical opera season. In July the summer sales begin and it’s a great time to find bargains in Italy’s fashion capital. In September, the temperature is much more pleasant but still summery. Not only are the fashion and design students starting the new semester but the city comes to life again, fashion lovers will be back for Women’s fashion week, festivals and events like the Milan Film Festival, Vogue Fashion Night Out and the Opera and Ballet season at La Scala begin. October is not terribly cold and the autumn colors and warm light prepare the city for winter. The holidays and cooler season starts with All Saints Day (1 Nov) when the traditional pan dei morti is in the pastry shops (my favorite ), and soon after, the city is decorated for Christmas. There are markets and beautiful shop windows, great smells of roasting chestnuts and music in the air. Get in from out of the December cold and enjoy classical and contemporary music, as well as philharmonic and virtuosi concerts at La Scala and other concert venues.